The conventional approaches used for the production of particulate molecular biomaterials usually follow easy preparation methods at the laboratory scale, but they fail when scaling-up to industrial level. NANBIOSIS approach offers novel synthetic strategies and experimental setup for the advanced preparation of a wide range of nanoparticles, including inorganic and soft nanoparticles with biomedical application. An example is CF-based methodology which presents several advantages including the reduction of organic solvent use, low working temperatures, few operational steps and easy scale-up for the preparation of uniformly structured materials with precise and reproducible structural characteristics at micro-, nano- and supramolecular levels. Furthermore, CF-based methods have been shown to be suitable processes for the one-step preparation of polymeric micro- and nanoparticles and nanovesicles for the delivery of therapeutic entities with increased bioavailability, efficacy, stability and selectivity. – Nanovesicular systems composed by sterols and cationic surfactants. – Entrapment of dyes, stabilizing and targeting moieties. 1. New nanodrug improves the treatment of diabetic foot ulcers (http://www.dicat.csic.es/rdcsic/index.php/en/biologia-y-biomedicina-2/108-histories-d-exit/310-una-nanomedicina-mejora-la-regeneracion-de-las-ulceras-de-pie-diabetico), Patent WO 2014/019555 A1. 2. Multifunctional Nanovesicle-Bioactive Conjugates Prepared by a One-Step Scalable Method Using CO2-Expanded Solvents, Nano Letters, DOI: 10.1021/nl4017072. – DDS for both pharmaceuticals and biopharmaceuticals. 1. Multifunctional Nanovesicle-Bioactive Conjugates Prepared by a One-Step Scalable Method Using CO2-Expanded Solvents, Nano Letters, DOI: 10.1021/nl4017072. – DDS for both pharmaceuticals and biopharmaceuticals, with high stability due to the functionalization with hydrophilic poly (ethylene glycol) (PEG), a stealth agent used to prolong blood-circulation time while reducing mononuclear phagocyte system uptake. – Entrapment of dyes and targeting moieties. – Polymeric Nanoparticles composed by biocompatibles polymers, such as PVP, GANTREZ, EUDRAGIT, PEG, CYCLODEXTRINES. – RSC Adv., 2016,6, 58723-58732. – Nanoscale. 2014 Aug 7;6(15):9230-40. – ACS Appl Mater Interfaces. 2016 Aug 24;8(33):21545-54. – ActaBiomater. 2017 Mar 1;50:493-501. – DDS for both pharmaceuticals and biopharmaceuticals, with high stability due to the functionalization with an RGD targeting peptide. – “Active targeting” through the incorporation of specific molecules on the outer surface of nanovesicles, which can provide more effective therapeutic action to a nanomedicine, due to a more specific and effective cellular uptake. It gathers several laboratories, perfectly equipped, to perform the mission of this facility: the development, characterization, and large-scale production of molecular biomaterials of therapeutic or biomedical interest, with controlled micro-, nano- and supramolecular structure. One example of Key-Enabling-Technology (KET) available in this unit is a simple one-step methodology, DELOS-SUSP, based on the use of compressed fluids (CF), such as CO2, to prepare particulate materials with precise and reproducible structural characteristics at micro-, nano- and supramolecular levels (size, shape, internal structural gradients, supra­molecular organization and crystalline purity).This example shows one of the singularities of this unit is that counts with CF–based plants at different scales, from mL to L, which allow process development by QbD and process scale-up. This unit offers novel synthetic strategies and experimental setup for the advanced preparation of a wide range of nanoparticles, including inorganic and soft nanoparticles with biomedical application. 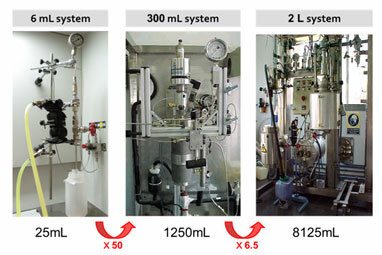 The new methodologies include microreactors, laser pyrolysis reactor and electro spinning. 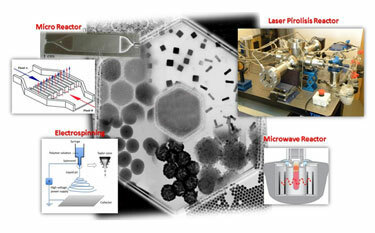 Both laser pyrolysis and microreactors as belonging to the group of enabling technologies, which allow new goals in reproducibility and scale-up production of nanomaterials. As for the electro spinning, this is a new infrastructure that allows the preparation of nanowires and fibres, formed by different materials.